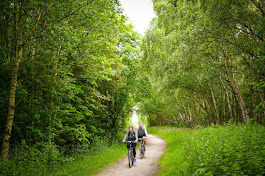 On Sunday the 14th May 2017 Staff and volunteers of Sustrans and the Trans Pennine Trail will be attending the Meadow site in Maghull, Merseyside. There are various activities taking place through the day and you are invited to come along to the project site. We have been awarded funding to transform this area of land from a misused, overgrown stretch of path into an area that will be of benefit to the community, path users and also the wildlife of the area. Over the past year, we have cleared a large majority of the brambles and overgrowth, installed benches, begun to install bird and bug houses and scattered wildflower seeds. In preparation for the 14th May, we have ordered 500 wildflower plants ready to be planted on the site. This is your opportunity to come along, visit and discuss the project... take away some information... and if you can, lend a hand! Please also take this opportunity to walk or cycle along the this area of the Cheshire Lines (NCN 62/Trans Pennine Trail)... It's a beautiful and amazing resource that we have in our area! 1-3pm - Wildflower planting, publicity stand and kids activities. ...are available for purchase from Sefton Meadows Garden Centre and Cafe that are in close proximity to the site area. If you are attending to participate in any of the raking, clearing and planting, please wear suitable clothing, sturdy footwear and gardening gloves.